Canada’s Olympic dynamic medal-winning sprinter, Andre de Grasse will compete at The Vancouver Sun Harry Jerome International Track Classic. China will be led by sprinters preparing for the 2020 Olympics in Tokyo. This event is highly appropriate as 2018 is the official year of China Canada Tourism. Andre De Grasse reached world prominence at the Rio Summer Olympics where he engaged in some thrilling matchups with multiple-time gold medalist Usain Bolt of Jamaica. De Grasse won a silver medal in the 200-metres and bronze in both the 100 and 400-metre relays in Rio. The Harry Jerome International Track Classic is Canada's longest-running track and field event. In its 35-year history, world and Olympic champions, world record holders, Canadian stars and young hopefuls have thrilled spectators, achieved personal bests and, thanks to the vision and dedication of the Achilles International Track and Field Society, continued in their quest to become Faster, Higher and Stronger. 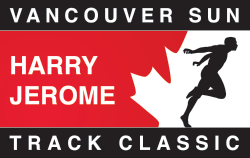 The Vancouver Sun Harry Jerome Track Classic is hosted by the Achilles International Track & Field Society, a non-profit society registered in British Columbia. Net proceeds from this event support track and field competition in BC. Athletes will receive their meet packages at the Hilton Vancouver Metrotown (Meet Central) or at the Swangard Stadium in Burnaby. This year, athletes will be supplied with one bib with their names and are asked to attach these to the front of their singlets. The exception will be the pole vault where bib can be used on back. Hip numbers will be assigned and distributed at the line start of each track event and must be affixed to both right and left sides of all athletes. Runners can use Central Park trails and stadium back stretch of track to warm-up prior to their event. After marshalling athletes, will be escorted onto the track and allowed to set their blocks and to do a quick stride. For field event athletes there will be official warm-ups prior to the competition. Marshalling will take place at the start location for each event 20 to 30 minutes before the posted start time. Runners can use Central Park trails and back stretch of the track to warm up prior to their event. Once marshalling for an event is complete track athletes will be allowed to set their blocks and to do a quick stride – for field event athletes, there will be official warm ups prior to the start of the competition. Athletes will be required to assemble for the official introductions prior to the start of the event. The best way to get to Swangard Stadium is via the official bus provided from the meet hotel in Burnaby. · 8:00 pm & 10:30 pm: depart stadium for hotel. Will arrange to have small bus available for athletes in Doping Control. Swangard Stadium is located near the Patterson Station on the Expo Line. The closest station to the Hilton Vancouver Metrotown is the Metrotown station. Travel time from Metrotown station on the Expo Line to the Patterson station is approximately 5 minutes via SkyTrain plus an 800m walk to Swangard Stadium. Will be available at both the Hilton Vancouver Metrotownand Swangard Stadium. Schedules will be posted at the Meet Central room. Planning on distribution 30k to winner, 10k to loser of Team Sprint Challenge. Hertz is proud to sponsor the Vancouver Sun Harry Jerome International Track Classic and is providing up to 30% discount on rental cars for all athletes and friends and families of the Jerome. Please click HERE to obtain a quote with the discount applied, or by calling 1-800-263-0600 and quoting Customer Discount Number (CDP ID #) 2151586.
please take Sky train from the airport to the meet hotel. This hotel has a 24-hour fitness center with a treadmill, stairclimber, exercise bike, rowing machine, and free weights. The property has connecting/adjoining rooms, which are subject to availability and can be requested by contacting the property using the number on the booking.